“Historically, I knew women had been ignored and erased. But I suddenly realized that, outside the historical record, the men were also ignored and erased. 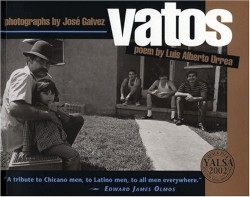 The modern Xicano/Mexicano/ Latino man was invisible.” This strong belief that someone had to speak out, be a voice for all these fathers, uncles, and brothers, drove Urrea to create the Hymn to Vatos; vatos who will never be in a poem. Chiefly of Los Angeles, California and Tucson, Arizona, these vatos, the dudes/guys, are represented through the words of this litany. Well outside the usual style of what is considered mainstream contemporary poetry, Urrea draws strongly upon the repetition of oral tradition and in his own words, the poem is like the chanting of “100 grandmothers praying to Guadalupe.” The more distant indigenous roots of the Americas are also evident. In other photos, readers see first communions, car-hopping competitions, Pachuco gangsters dressed to the nines, war veterans, farm workers, tattooed vatos in public parks, and vatos double-clutching Budweiser cans. A grandfather holds onto his small grandchild as if he is holding on for his life. In fact he is, holding onto his very life itself. In “Altar Boys 1986,” a boy with a divine expression seems to be miles away from the two clowning fellows he stands between. Where he seems celestial and somehow elevated above worldly concerns, in his alb, the other boys appear childish. Urrea is a novelist, essayist, and poet who resides with his family in Chicago where he teaches. He has received many awards including the American Book Award and the Western States Book Award for Poetry. Galvez is a Pulitzer Prize winning photographer who has worked with the L.A. Times and other newspapers, in addition to freelance photojournalism.